Whether you know it as remote work, telecommuting or freelancing, the chances are that you either do it yourself or know someone who does. Thanks to rapid developments in technology, it’s now easier than ever before for people to work remotely. In fact, according to figures from the Freelancers’ Union, 54 million U.S. workers did some form of freelance work in 2015. To break that down even further, findings from the latest annual Work and Education poll reveal that 9% of employees work remotely more than 10 days a month. Despite initial trepidation surrounding the productivity of staff outside of the office environment, 58% of Americans now believe telecommuters to be just as productive as office workers. Perhaps that’s because working from home can be both liberating and exciting, and can give you back the enthusiasm that your nine-to-five office routine has sucked out of you. However, life without colleagues can soon become lonely and – with little social interaction and no office chatter – many remote workers find themselves feeling isolated and cut off from their team. 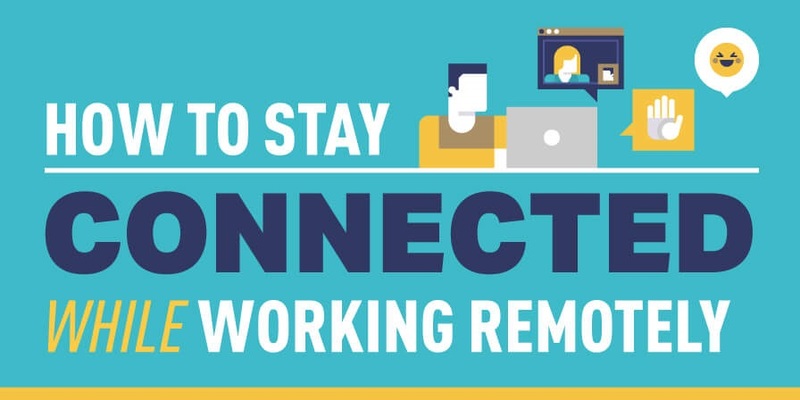 Yet, as our latest infographic shows, working from home doesn’t have to leave you out-of-the-way and alone.